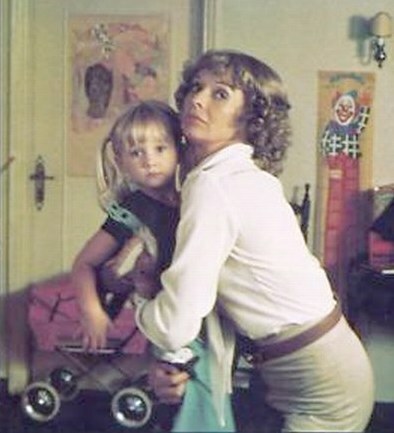 The abduction of Ellen Bracken, played by British actress Susannah York, and her two children starts this 1976 hang gliding misadventure. Summer 1976. The first Concordes (supersonic airliners) had entered service. The prototype space shuttle was yet to fly. Gerald Ford was President and ‘Big Jim’ Callaghan was British Prime Minister. There was no DVD, no personal computer, and even the videotape cassette was yet to become available to the public. You might have an 8 millimetre film projector if you were lucky, but, to watch a film, you normally queued for a half hour in the street in the early evening for the movie theater (cinema here in Britain) or you waited a few years to see it on your small black-and-white television. Inside the cinema entrance, over on one side where hang gliding posters adorned the walls, people crowded around a table covered with brochures advertising the local manufacturer and hang gliding school, Kestrel Kites. Not only did I and my friends know those guys, we knew the pilots in the film, who had stopped by at the British hang gliding championship competition the previous summer while touring Europe on their way home from flying for the film in Greece. The giant screen lit up, the picture distorted by red curtains draped in front of it, which then parted. After a booming yet somehow muffled voice enumerated the advantages of a local hotel, which was shown in Technicolor on the huge screen (and, anyway, you passed the real thing on the way in a hundred yards up the street) the film started. 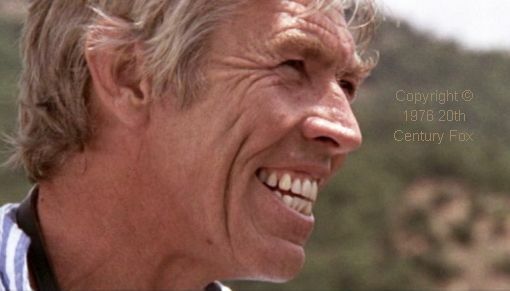 Jim McCabe (James Coburn) reluctantly admits to the sense of Inspector Nikolidis’ understanding of the situation. Jim McCabe (James Coburn) is a flying boat pilot on missions that one can only speculate about, but which result in bullets holes appearing in his aircraft. McCabe makes an entrance in a CL-215. He is not using it to put out forest fires. Like the Japanese soldiers who occasionally emerged from jungles on Pacific islands until the late 1960s, this ship’s captain appears to be still fighting World War 2. He is concerned that his friend McCabe has not seen a newspaper for a while, and is therefore unaware of the front page news, which concerns his ex wife and son. 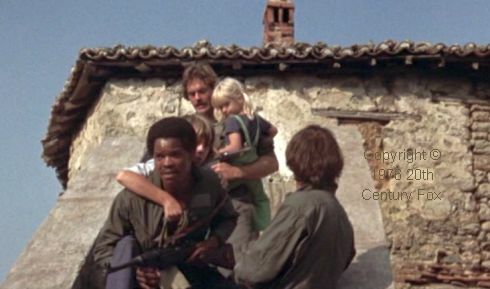 While McCabe plans the rescue of Ellen and the kids, Jonas Bracken (Robert Culp) who is Ellen’s current ‘other half’ (as they say nowadays) waits with the police by a radio supplied by the World Activist Revolutionary Army to cooperate fully with their demands. They want more than money. Anyone familiar with the American war in Vietnam, which finally ended in a communist victory earlier that year (this was filmed in 1975) will recognize the items on their shopping list. This upstanding young fellow is about to place himself in harm’s way. The explosions are convincing. I read that an electrician was killed when one went wrong and the film makers had to bribe government officials to avoid arrest. Greece was at the time a military dictatorship. And I thought hang gliding was dangerous! 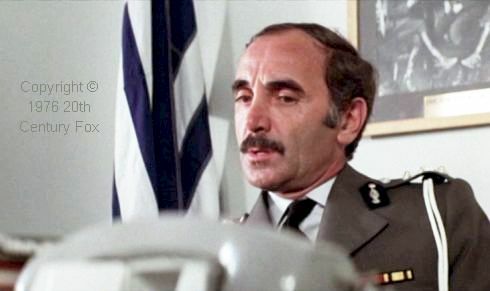 Inspector Nikolidis is played by Charles Aznavour. In Britain, Charles Aznavour, son of Armenian immigrants who fled to France following the Turkish massacre, was a popular singer and he appeared in the early 1970s on the BBC television weekly Top of the Pops. In Sky Riders, whose only music is the overbearing wailing of violins and trumpets as backing for the action sequences, he puts in a sterling performance as an irascible police chief. Every house had a darkroom — if only a temporary conversion of a bathroom – in which you developed your own black-and-white films in the glow of a red light. The device at left is an enlarger, which projects lamplight downwards through the developed negative onto photo-sensitive paper, on which the image only appears later; when you immerse the exposed sheet in a chemical bath. (No, you didn’t fill the bath with chemical solution; just a shallow enamel tray.) How times have changed! Coburn’s principal talent seemed to be that of periodically grinning to reveal his huge set of teeth. No, that’s a smoke canister on a wire under the glider. Notice how the streamers indicate the airflow at the root and tips. It is much clearer in the motion of the film. The Wills Wing Swallowtail, an improvement on the original ‘standard Rogallo’ hang glider, was state-of-the-art in 1975. Some of the most captivating flying action I have seen is in The Battle of Britain (1968), Top Gun (1986), the partly computer-generated Pearl Harbour (2001) and Red Tails (2012). However, the flying in Sky Riders (1976) surpasses even those. These scenes, filmed from a helicopter, constitute some of the most dramatic flying film ever taken. The sequences that purport to show McCabe learning to fly a hang glider demonstrate what people meant when they said Bob Wills could make a hang glider talk. (Not literally of course. I hate to think what my hang glider would say about me…) Coburn was up for it, but the insurance people vetoed his participation as a solo pilot. Incidentally, none of the pilots appear ‘in person’ in the movie, but the editing is seamless. 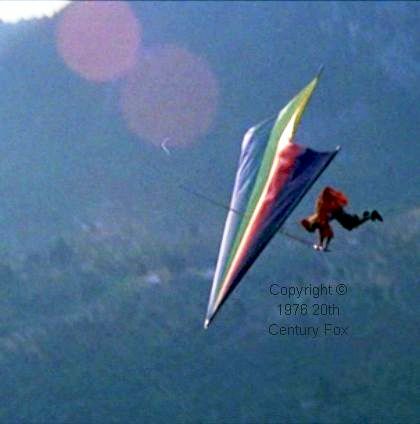 For example, the cut from a hang glider flaring for landing to a closer view of actors running the glider to a stand-still, nose-high, is noticeable only if you are watching for the cut. A woman stirring the logs of the hangies’ campfire ventures the opinion that there is something to be said in favour of the terrorists’ position (that wealth should be redistributed more equally). One man’s terrorist is another woman’s freedom fighter, after all. However, McCabe’s money talks louder even than Bob Wills’ hang glider. The climbing scene is overdubbed with dialog about the wind being too strong. Throughout the film, the storyline and action are combined using that technique. It is a well made film. However, it is an old film, so you need patience with some of the tension building drama in the first half of the story. The partly-rigged Swallowtail hang gliders on a mountain-top apparently under a full moon are actually under a full sun. I assume that they either used a dark filter over the camera or they processed the film to make it look like night. Whichever, the result strikes me as reasonably effective. Still bearing the scars of the 1968 Paris riots, this guy (played by Werner Pochath) leads the World Activist Revolutionary Army in its quest for equality of opportunity for all. 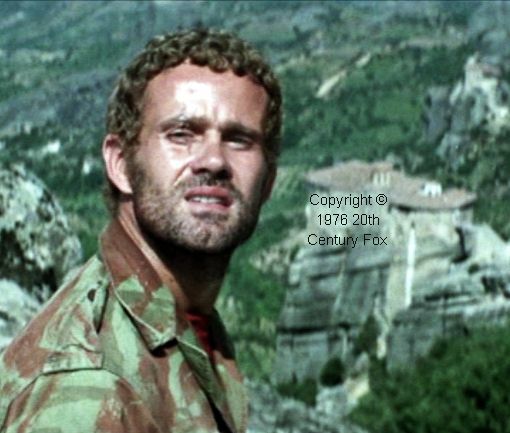 The film makers obtained the cooperation of the armed forces of Greece in the making of Sky Riders. 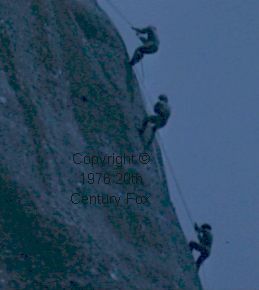 Flying above and between the vertical rock pinnacles was as dangerous as it looks, according to Chris Wills’ later written account. You can see the effects of turbulence on the gliders in some sequences. This was before the emergency parachute had been adapted for use in hang gliding, incidentally. 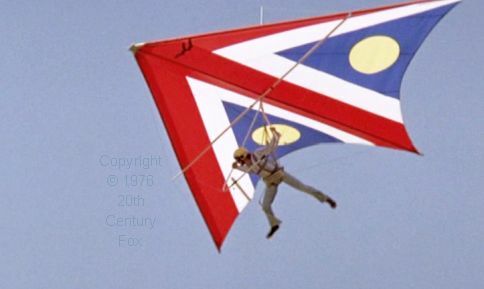 In one scene, a helicopter operated by the freedom fighters uses its rotor-wash in an attempt to down a hang glider. Ironically, the down-wash from a helicopter camera ship caused the crash that killed Bob Wills during filming for a Jeep commercial two years after the making of Sky Riders. The World Activist Revolutionary Army fought its last battle on the monastery at Meteora and the scene was then set for the coming age of Reagan and Thatcher. There would be no Sky Riders 2. The metallic smell of wet pavement alternated with petrol and diesel fumes as we emerged into the outside world. Street lights turned late dusk into night and vehicle lamps reflected on the ground as fine raindrops whipped along in the wind. Strange, it was hot and sunny two minutes ago. No, that was in the film. McCabe learns to fly a hang glider to a proficiency adequate for strong winds in mountains in about one day. I would not like to say it is impossible, but learning to fly a hang glider is a long and arduous retraining of one’s mind and body, which is one reason that hang gliding was never as popular as some of us thought it would become. And being an airplane pilot (like McCabe) while certainly helping in some respects, can be a disadvantage. Just ask David Cook, former jet bomber pilot and designer of the CFM Shadow powered ultralight. He was not the only airplane pilot unable to re-adjust his reflexes to fly a weight-shift controlled hang glider. As is common with old films, there is too much backing music; a hangover from the days of silent movies: At least they manage a few bars of The Battle of Britain backing music when Susannah York is supposedly airborne. Sky Riders was released on DVD and Blu-ray in early 2017. 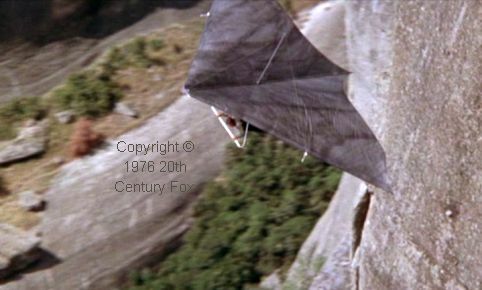 Many of the hang gliding scenes make poor stills because the black-painted sails—sunlit to a mottled grey—blend with the scenery. Those scenes require the three-dimensional movement imparted by being filmed from a moving helicopter. The first photo of Susannah York is from a poster advertising the movie. After the filming was completed, in August 1975 the Wills family and their black-painted Swallowtails were at Mere in Wiltshire for the British hang gliding championships. On the main day of the event I was the next in the long line for launch after Bob Wills. (Therefore I did not see his flight; I was concentrating instead on the launch marshal’s directions.) That hours-long queue afforded me the opportunity to examine his glider and harness as well as to obtain his opinions about its flying characteristics. The Chris Wills quote about ‘flying’ the crane is from his article In Greece with 20th Century Fox as printed in Sky Adventures, Legends and Stories About the Early Days of Hang Gliding and Paragliding, edited by Jim ‘Sky Dog’ and Maggie Palmieri, 1998. He had to come to hawaii to set a world distance record with me back in november of 1975.. I miss being in this movie by only 2 months. 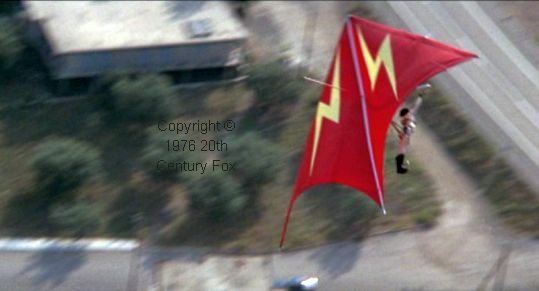 I wish bob had not done the commercial that killed him because he was an exceptionally coordinated and talented hang glider pilot. We’ve always had so many competitions together both on our motorcycles as well as playing ping pong and other cord nation type games. He was a true friend and I really miss him.